I prattle on a lot about proportion and fit. I think you’ve got fit down. So here’s a bit more about proportion. Two sweaters, two pairs of trousers, four radically different looks. 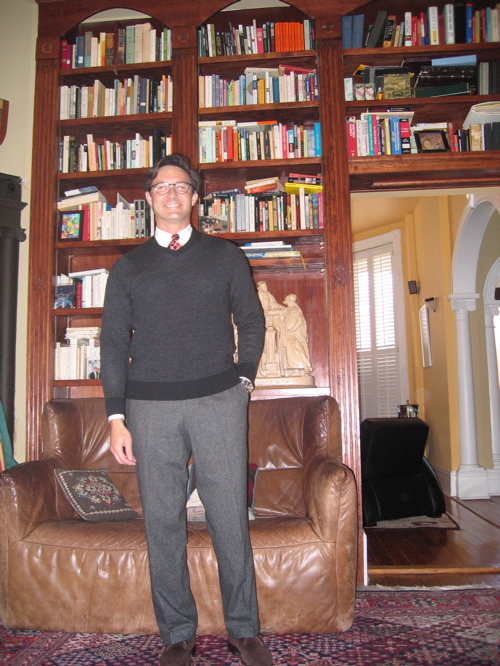 A fuller, shawl collar sweater worn with full cut, double forward pleated trousers. Do not attempt this in public. 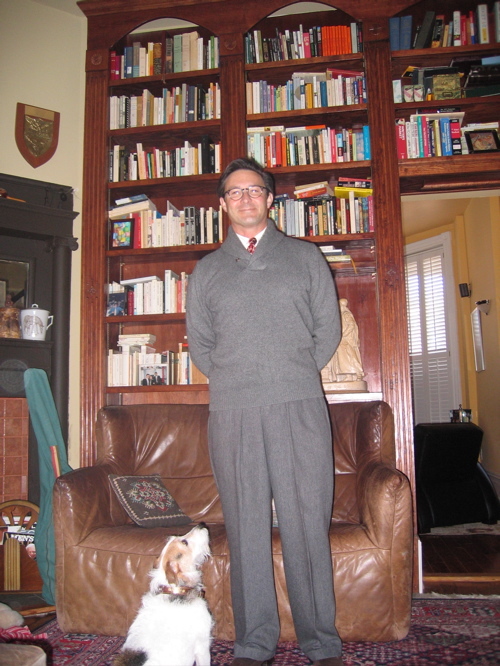 The same sweater worn with flat front, Donegal tweed trousers. Flat front trousers with a trimmer sweater. 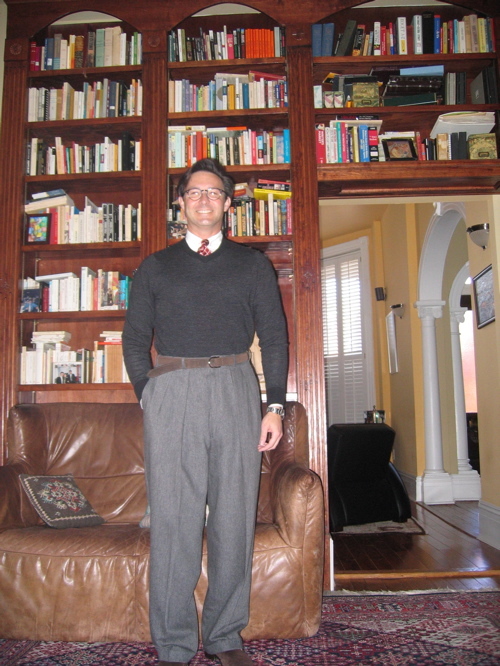 And finally, a return to the shawl collar sweater worn over a trimmer cut trouser. Another way to get it right. If I take anything from this little experiment, it is a simple rule: fuller articles of clothing above the belt need trimmer articles of clothing below. Fuller trousers require slimmer cut coats, sweaters and shirts. 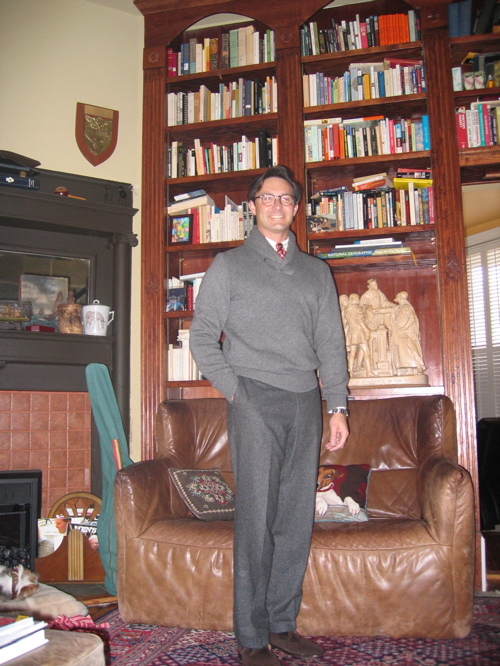 This entry was posted in Elegantology and tagged Armani, Donegal tweed, shawl collar sweater. Bookmark the permalink. Great lesson and so much easier to see when you go to the effort of trying all the variations. Thanks for letting us learn the easy way — from the pictures. And the last one is a great look but, then again, you have some very nice clothes. Nicely done! And I am jealous. I may have to drop by and borrow some duds. Al, thanks! I can send my measurements. They vary by decade. Whenever you’re in town, don’t bother to pack. L2R, thanks for the vote of confidence. The first is very comfortable, but the least flattering to my eye, followed by the third. Still, it’s a matter of degrees and I encourage you to experiment.